via PSFK: Giant Acoustic Organ Installation Makes Wind Audible @PSFK. Dr . Garth Paine. Karlax and Kyma – 1st contact. Karlax and Kyma – 1st contact from Garth Paine on Vimeo. 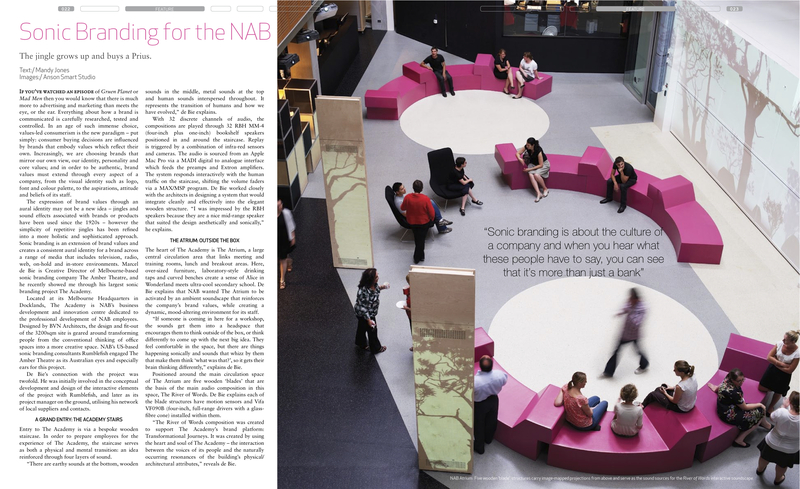 Read the article by AV Magazine about the work The Amber Theatre did for The Academy at the National Australia Bank. “The presence of machinery in our lives is constant. It is the mechanical hand that moulds our everyday objects, the food, the clothing, tools and technology that we rely on. The extent to which we engage with mechanical production is increasing at an exponential rate. OUR RESPONSE raises awareness about the problem and experience of cyberbullying. Technology, machines and devices are integral to the lives of young people. They are a primary tool for consuming and sharing information and knowledge and building social identities. People who are subjected to cyberbullying are never left alone, it is incessant. The girl is being abused – constantly. The abuse is inescapable and impossible to ignore, the sound follows you and can be heard no matter where you are in the space. It drives you crazy and you want it to go away. This is what cyberbullying feels like. The only way to stop the abuse and insults is to go up to and interact with the girl, to pay attention to her, to address the issue. The abuse is transformed into beautiful ambient sound which changes as you comfort her by touching her heart, and arms and speak her ears. A HUGE THANK YOU to Ben and the wonderful and inspiring teachers and students at Filmbites Youth Film School who so graciously gave their time recording voice-overs for this project. Click the image to download this amazing music for free. Some interesting and positive ideas from Mark Holden on how songwriters, artists and rights holders can profit from filesharing. People are going to share and download ‘free’ music. File sharing sites will profit from this via ads and incentives. Tax/levy the profits of the file sharing sites. Use fingerprinting technology to determine which artists/rights holders are being shared. Distribute income to the correct rights holders and artists. This new and additional revenue model also gives rights holders and record companies more bargaining power when negotiating with Apple’s iTunes. And lawyers would still have a job. Make music on any surface. So many fun and useful applications. A retail innovation centred around interactive fabrics that create music proved a big hit in Melbourne. Pop-up store and fashion label, Where Lovers Lie, teamed up with sonic branding experts, the Amber Theatre, as part of Melbourne Music Week. They then combined the mediums of music and fashion to create an interactive musical instrument controlled by smart textiles. Store visitors were invited to squeeze the clothing on a mannequin, which then played music inside a computer that is connected to the fabric. A spokesman from the Squeeze Me Lightly Where Lovers Lie initiative said it was designed to help change customers from passive browsers into active creators of new, exciting and memorable retail experiences. Visitors quickly understood how it worked and formed impromptu jams before then showing newcomers what to do. The installation, in Melbourne’s GPO, Bourke Street, runs until Saturday. An unusual interactive musical instrument – disguised as a mannequin – has gone down a storm in Melbourne in a recent experiential sonic branding campaign. The creators of the imaginative retail installation wanted their end product to represent the future of sound in fashion – and, from the public reaction, they look to have succeeded. Sonic branding experts The Amber Theatre and fashion label Where Lovers Lie joined forces to develop Squeeze Me Lightly Where Lovers Lie. 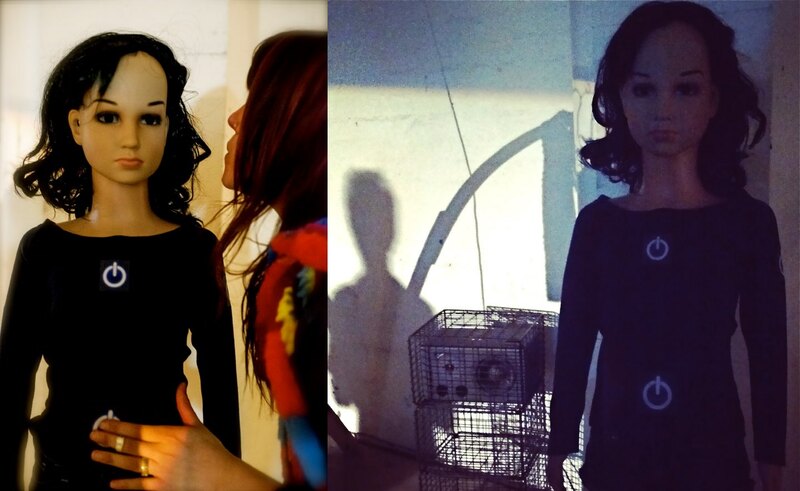 Their creation is a mannequin dressed in black, with wing-like arms that, when squeezed, plays music. The creation combines sonic branding, fashion and visual merchandising, challenging outdated and boring retail environments and transforming customers from passive browsers to creators of new and exciting retail experiences. The artwork was on display in Melbourne’s GPO. Marcel de Bie, The Amber Theatre’s creative director, said people’s reactions to the installation were amazing.